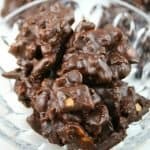 Peanutty Pie Crust Clusters are small pieces of baked pie crust mixed with peanut butter, peanuts and toffee bits, then dipped in chocolate. This is the recipe that won the 47th Pillsbury Bake-Off which was announced last week on ABC’s The Chew. As you might know, I was a finalist in the bake-off with my recipe for Lemon-Blueberry Muffins. 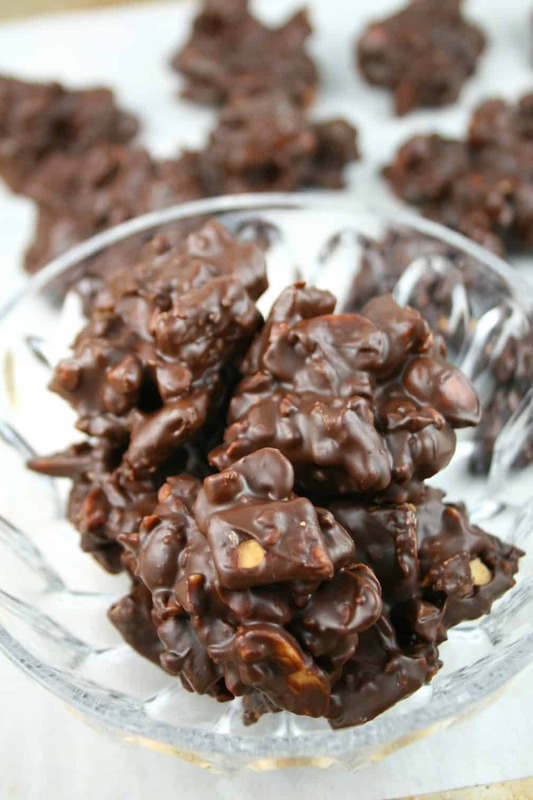 The sweet lady that was baking next to me in the contest which took place in Nashville on November 3, was Beth Royals and she won the million with this scrumptious recipe for Peanutty Pie Crust Clusters. So incredibly good!! Her recipe uses white chocolate chips which is yummy, but I thought I would make it with semisweet chocolate instead. It reminds me of chocolate haystacks, but it has pie crust instead of chinese noodles. First you chop up the pie crust using a pizza cutter. Bake it at 450° for 6-8 minutes (watch it carefully because it can burn easily). Melt your chocolate with some shortening and peanut butter in the microwave. Stir until smooth. Fold in your cooled pie crust pieces, peanuts and toffee bits. Let cool in the fridge on parchment lined cookies sheets. Super easy and very tasty! A great addition to your holiday cookie tray too. Note: Recipe below is the Pillsbury recipe with the white chocolate. 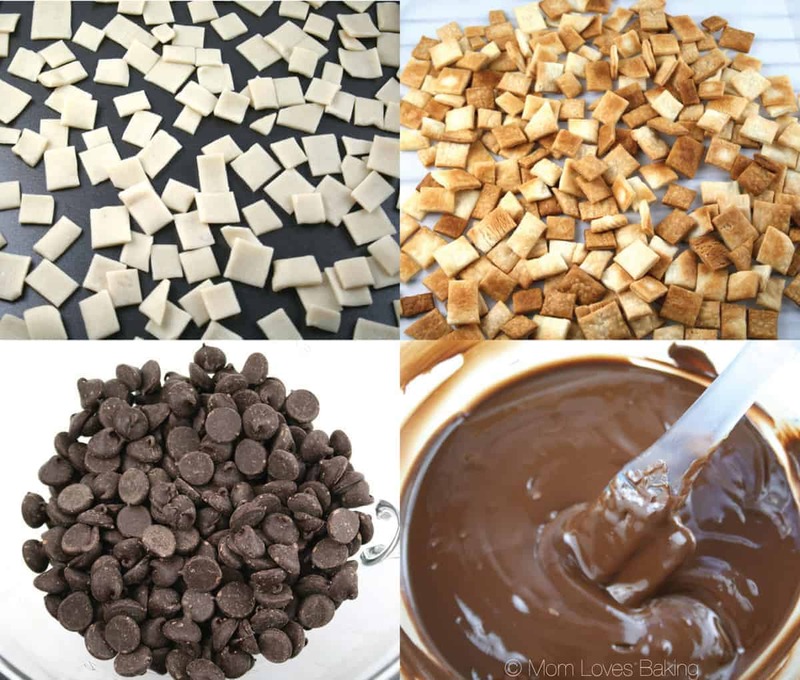 If you want to make it with dark chocolate, simply substitute the same amount of semisweet chocolate chips instead of the white chocolate chips. 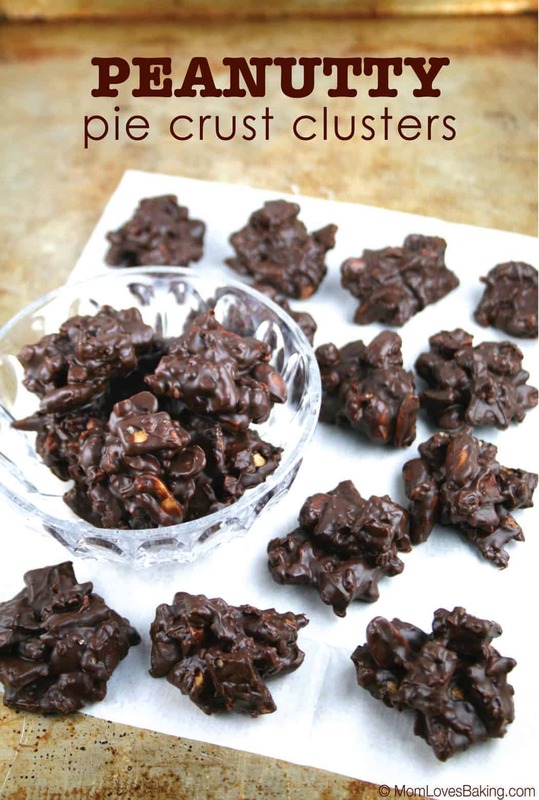 Peanutty Pie Crust Clusters would make a great gift for the holidays. You can even say they’re worth a million dollars. And it’s true! Heat oven to 450°F. Line 2 cookie sheets with Reynolds® Cut-Rite® Wax Paper. Unroll pie crust on work surface. With pizza cutter or knife, cut into 16 rows by 16 rows to make small squares. Arrange squares in single layer on large ungreased cookie sheet. Bake 6 to 8 minutes or until light golden brown. Remove squares from pan to cooling rack. Cool completely, about 5 minutes. In large microwavable bowl, microwave baking chips, shortening and peanut butter uncovered on High 1 minute to 1 minute 30 seconds, stirring once, until chips can be stirred smooth. Add pie crust squares, peanuts and toffee bits; stir gently until evenly coated. Immediately drop by heaping tablespoonfuls onto lined cookie sheets. (If mixture gets too thick, microwave on High 15 seconds; stir.) Refrigerate about 15 minutes or until set. Store covered.